The average annual energy cost of a home is about $2,200, and appliances are a major part of home energy use (U.S. DOE, May 2014). Approximately 13 percent of your average annual energy cost goes to operating your refrigerator, dishwasher, clothes washer and dryer (ENERGY STAR®, n.d.). Some utility companies have buy-back programs for old appliances. When shopping for appliances, remember that there are actually three prices involved. The first is the one everyone thinks of: the purchase price. The second price is for repairs and maintenance. But there’s a third price, one that’s just as important: the operating cost of the appliance. Operating cost will depend on the cost of fuel (kilowatt-hour, cubic foot, therm, etc.) in your location, how much you use the appliance, the way you use it, and the overall energy efficiency of the appliance. Operating cost shows up on your utility bill each month for the life of the appliance: the refrigerator, for example, lasts approximately 11 years, and the clothes washer averages about 10 years. You’ll need to consider how any given appliance will affect your utility usage. Naturally, you want your total expenditure to be as low as possible! But remember to think long term: an energy-efficient appliance may have a higher purchase price—but your operating costs could be significantly lower, and often, the maintenance/repair costs on a new appliance can be lower, too. Check consumer advocacy print and Internet sources for information such as repair history and maintenance needs. What should I look for when seeking an energy-efficient appliance or electronic device? There are two key elements that you need to look for when you shop for an energy-efficient appliance or electronic device: the ENERGY STAR logo, and the EnergyGuide label. What is the ENERGY STAR logo? Figure 1. Sample ENERGY STAR logo for certified products. Credit: Courtesy of ENERGY STAR. ENERGY STAR is the name of a joint program between the U.S. Environmental Protection Agency (EPA) and the U.S. Department of Energy (DOE) that aims to assist in money savings and environmental protection by promoting energy-efficient products and practices. Highly specific minimum standards and testing procedures of each type of product “set the bar” for meeting strict energy-efficiency guidelines set by the EPA and DOE. If a product meets or exceeds the minimum standards, the product earns the ENERGY STAR certification and can then be promoted as such (Figure 1). Do all types of appliances and electronics have ENERGY STAR guidelines or specifications? Figure 2. Sample ENERGY STAR Most Efficient logo for use on qualified products. Credit: Courtesy of ENERGY STAR. Note that the EPA has a designated category for ENERGY STAR Most Efficient 2015 (Figure 2). This label recognizes products that deliver cutting-edge energy efficiency along with the latest in technological innovation. The year included on the label designates that the device/appliance meets the criteria for the year indicated. If interested, learn more about this label here. However, manufacturers of these and many other appliance types must provide potential buyers pertinent information regarding a given product’s energy consumption on the standardized EnergyGuide label. 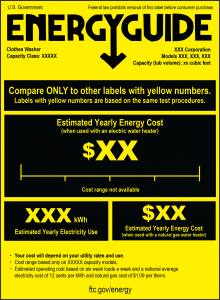 The EnergyGuide label (Figures 3 and 4) is a bright yellow tag that the Federal Trade Commission (FTC) developed to help consumers more easily compare energy efficiency among similar products. Note that the EnergyGuide label in Figure 4 reflects updated energy testing procedures and is different from those you may have seen in the past. 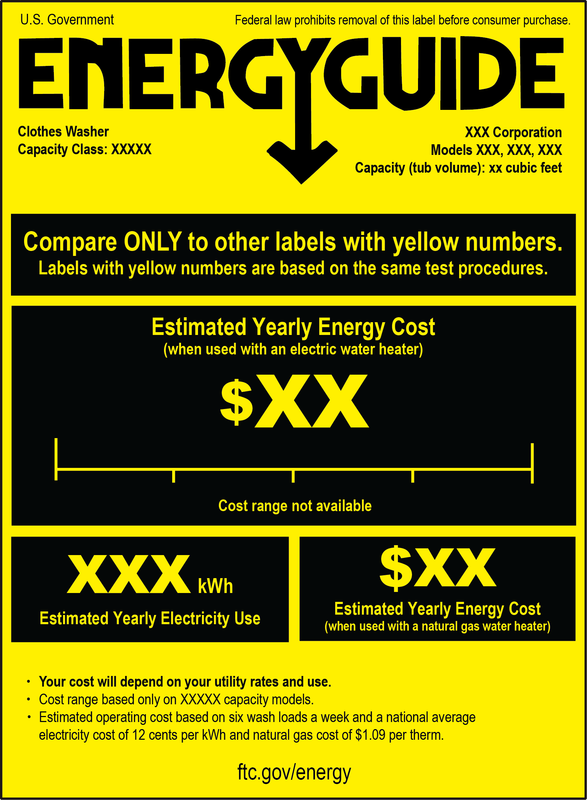 Previous labels (Figure 3) feature the numbers in black while these “transitional” new labels feature bright yellow numbers and were required on new clothes washers manufactured beginning March 7, 2015. So, before comparing the features of different products, make sure you are comparing models tested to the same energy-efficiency measures so you can make a more accurate comparison. The FTC has more information about reading the label here. Will I see the EnergyGuide labels on all products that use energy? Note that the Rule also includes labeling for plumbing products and ceiling fans as well as labeling requirements for certain types of light bulbs. What will the EnergyGuide label tell me? 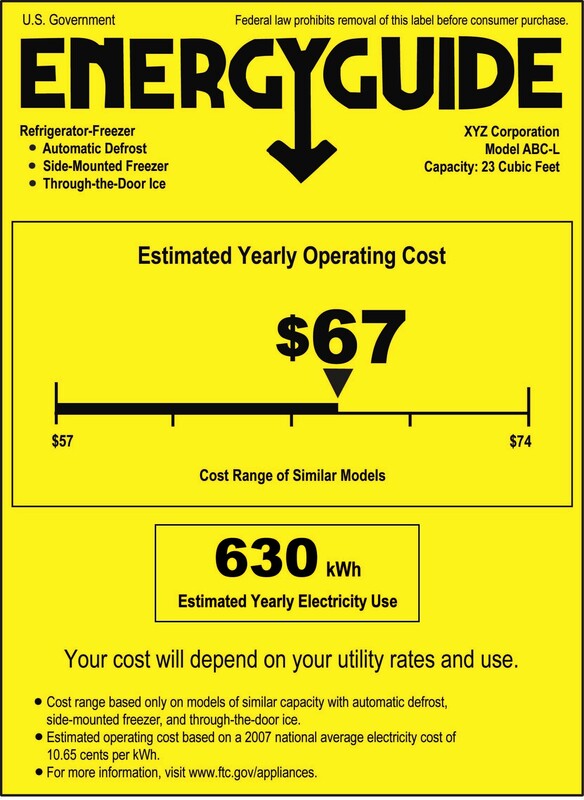 EnergyGuide labels for most appliances prominently display estimated yearly operating costs in dollars per year. Oftentimes this estimated yearly operating cost is shown within the operating cost range of similar models. However the labels are appliance specific. The FTC has more information about reading the EnergyGuide label here. Remember, EnergyGuide labels won’t tell you the best appliance to buy, but they do provide a lot of information to help you in your decision making. The labels also help consumers assess the trade-offs between the energy costs of their appliances and other expenditures. Make sure you compare similar models with similar capacities. For example, comparing one top-loading clothes washer with another top-loader that handles the same-size batch of laundry will help you make a more informed decision than comparing models that lack such similarities. Does an appliance with an EnergyGuide label also mean that it is ENERGY STAR certified? No, just the display of an EnergyGuide tag does not mean the appliance is ENERGY STAR certified. 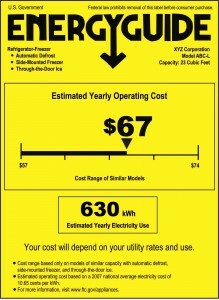 Some manufacturers are incorporating the voluntary ENERGY STAR logo on their certified appliance EnergyGuide labels, but if you don’t see the ENERGY STAR logo on the bright yellow EnergyGuide tag, investigate further—the ENERGY STAR logo might be on the appliance itself, or perhaps the item hasn’t earned the ENERGY STAR certification. What are some other, more general energy-saving tips for appliances/electronics/office equipment? determine how much energy an item uses by following the instructions on the U.S. Department of Energy’s website at the Energy Saver page “Estimating Appliance and Home Electronic Energy Use. dispose of old appliances and electronics responsibly by contacting your local utility provider, waste management provider, and/or recycling location for instructions. When possible, work with retailers that partner with EPA’s voluntary Responsible Appliance Disposal (RAD) Program, and search the Earth911 website for recycling locations and more information. review the Consortium for Energy Efficiency’s information on the super efficient home appliances (SEHA) initiative for some products here. read about energy and/or water savings standards, which are either in place or under consideration, for residential products here. American Council for an Energy-Efficient Economy (ACEEE). Consumer Guide to Home Energy Savings Online. Retrieved June 10, 2015. Appliance Standards Awareness Project (ASAP). Products: Residential. Retrieved June 5, 2015. Consortium for Energy Efficiency (CEE). CEE Program Resources: Residential. Retrieved June 5, 2015. Earth911. Recycling Center Search & Recycling Guides. Retrieved June 3, 2015. Federal Trade Commission. 16 CFR Part 305. Energy and Water Use Labeling for Consumer Products under the Energy Policy and Conservation Act (“Energy Labeling Rule”). Retrieved June 8, 2015. Federal Trade Commission. (January, 2015). Shopping for home appliances? Use the EnergyGuide label. Retrieved on May 28, 2015. Federal Trade Commission. Transitional label – example. Retrieved May 28, 2015. Laitner, J., McDonnell, M., & Ehrhardt-Martinez, K. (November 13, 2014). The Energy Efficiency and Productivity Benefits of Smart Appliances and ICT-Enabled Networks: An Initial Assessment. Research Report F1402. American Council for an Energy-Efficient Economy. Retrieved May 28, 2015. Mauer, J., deLaski, A., Nadel, S., Fryer, A., & Young, R. (May 21, 2013). Better Appliances: An Analysis of Performance, Features, and Price as Efficiency Has Improved. Appliance Standards Awareness Project. Retrieved May 28, 2015. Miller, C., Sullivan, J., and Ahrentzen, S. 2012. Energy Efficient Building Construction in Florida, ISBN: 978-0-9852487-0-3, University of Florida, Gainesville, FL. U.S. Department of Energy (DOE). Database of State Incentives for Renewables & Efficiency (DSIRE). Retrieved May 29, 2015. U.S. Department of Energy (DOE). (May 2014). Energy Saver: Tips on Saving Money & Energy at Home. Retrieved May 26, 2015. U.S. Department of Energy (DOE). (May 10, 2015). Estimating Appliance and Home Electronic Energy Use. Retrieved May 28, 2015. U.S. Department of Energy (DOE). (January 2, 2014). Resolve to Save Energy This Year. Retrieved May 4, 2015. U.S. Department of Energy (DOE). (July 16, 2014). Tips: Home Office and Electronics. Retrieved June 4, 2015. U.S. Environmental Protection Agency. RAD Partners and Affiliates. Retrieved June 3, 2015. U.S. Environmental Protection Agency. ENERGY STAR. U.S. Environmental Protection Agency, ENERGY STAR. ENERGY STAR Most Efficient 2015 Criteria. Retrieved June 3, 2015. U.S. Environmental Protection Agency, ENERGY STAR. Special Offers and Rebates from ENERGY STAR Partners. Retrieved May 29, 2015. U.S. Environmental Protection Agency, ENERGY STAR. (n.d.) Save Energy at Home. Retrieved on May 26, 2015. This document is FCS3266, one of an Energy Efficient Homes series of the Department of Family, Youth and Community Sciences, Florida Cooperative Extension Service, Institute of Food and Agricultural Sciences, University of Florida. This material was initially prepared June 2008 with the support of the Department of Environmental Protection, Florida Energy Office, which is now the Florida Department of Agriculture and Consumer Services, Office of Energy. This revised version was prepared June 2012 with the support of the Florida Energy Systems Consortium and updated June 2015. Any opinions, findings, conclusions, or recommendations expressed herein are those of the author(s) and do not necessarily reflect the views of the sponsoring organizations. Please visit the EDIS website. Kathleen C. Ruppert, Extension scientist, Program for Resource Efficient Communities; Wendell A. Porter, lecturer and P.E., Department of Agricultural and Biological Engineering, Randall A. Cantrell, assistant professor, Department of Family, Youth and Community Sciences; Hyun-Jeong Lee, former assistant professor, Department of Family, Youth and Community Sciences; and Travis Prescott, former editor, IFAS Communications; University of Florida, Gainesville, FL 32611.